Another year, another step closer to climate doom unless we cut carbon pollution. What’s happening with electric cars at the start of 2018 is a sign that maybe, just maybe, we might be beginning to steer the ship toward less catastrophic waters. Established automakers and startups alike are introducing a bevy of new models. Meanwhile policymakers from Scandinavia to California are looking at how phase out gas-powered cars. And on the charging side, companies are already thinking about how to build a bare bones network and scale it up from there. Taken altogether, there’s a lot of encouragement that the electric car market is poised to move from its infancy to the toddler stage over the course of the next year. And with 14 percent of global greenhouse gas emissions due to transportation, that’s a decidedly important step. So far, sales have been driven largely driven by subsidies that make electric and hybrid cars attractive. Per capita, Norway has seen the fastest shift in the auto market of any country in the world. The country recently announced that more than half of all new car sales in 2017 were either electric or hybrids. Norwegian electric car buyers get tax breaks, don’t have to pay tolls, get access to bus lanes as well as free parking and charging. Finnoey—an island connected to the Norwegian mainland by a tunnel—has the highest adoption rate of electric cars in the world because residents can save up to $6,000 annually by not paying the tunnel toll. The subsidies have led to charges that rich Norwegians are the biggest beneficiaries because they’re using them to buy luxury vehicles at a discount. As a result, the government proposed what’s been dubbed the “Tesla Tax” late last year because it largely focuses on expensive, heavy vehicles like Tesla’s Model X. Regardless, what happens in Norway is just a drop in the global bucket. The country is home to just 2.66 million registered vehicles out of a global total of more than 1 billion cars and trucks on the road. What happens in the U.S., with nearly 131 million cars on the road, is a much bigger deal. The GOP tax bill passed late last year preserved an electric vehicle tax credit for consumers. That’s the good news. But at the moment, the Trump administration is reconsidering fuel efficiency standards for vehicles made from 2022-25. That includes California, which accounts for 13 percent of all registered automobiles. The state already has a federal exemption for stricter vehicle emissions standards and 13 states along with Washington, D.C. have adopted those standards as well. Legislation introduced in the state senate last week would put California’s ambitions into overdrive. The bill under consideration would ban the sale of fossil fuel-powered vehicles in the state by 2040. If it becomes law, California would join countries like France, Germany, and the U.K. that already announced similar gas-powered vehicle phase outs. More importantly, it could set wheels in motion for other states and send a message to manufacturers. “These policy proposals send a signal to the automakers that regulators are interested in moving away from petroleum-based vehicles,” Whitefoot said. All this is to say nothing of China, which is the world’s biggest electric car market. Last year, the Chinese government gave out subsidies in excess of $15,000 per vehicle. The country has 190,000 chargers installed to help juice those vehicles, with plans to expand that number to 800,000 in the next year (other countries are also pushing ahead expanding their networks, too). 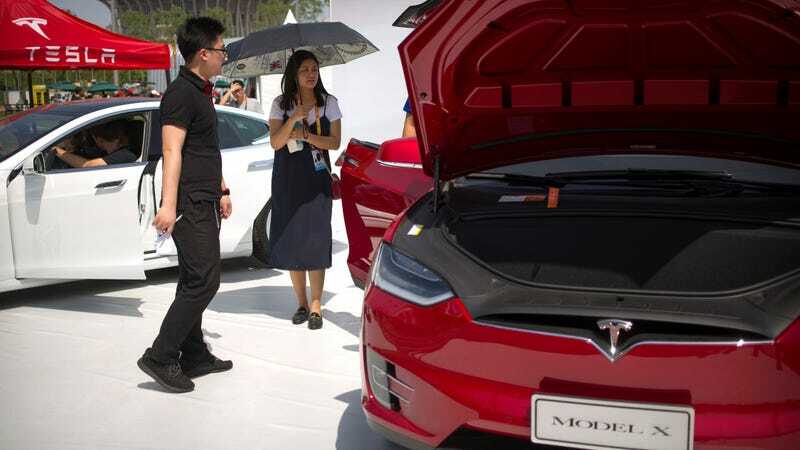 China also announced an electric and low-emission vehicle production quota under its new cap and trade plan. Taken together, these regulations are driving the current spread of electric vehicles worldwide. Consumer demand is playing but a tiny role despite an anticipated onslaught of 127 new models of electric cars coming in the next five years. But that could all change as batteries get cheaper, driving down the cost of cars and making them more appealing to the broader public.